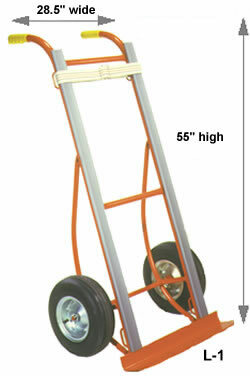 Welded frame and handles for maximum strength. 2" wide heavy duty web belt is standard on all models. 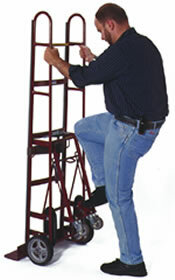 Continuos belt stair climbers standard on all models. All joints double welded for maximum durability. with 5/8" precision ball bearings. 26.5" from noseplate to center of belt. Noseplate 24" wide x 5" deep. 28.5" from noseplate to center of belt. 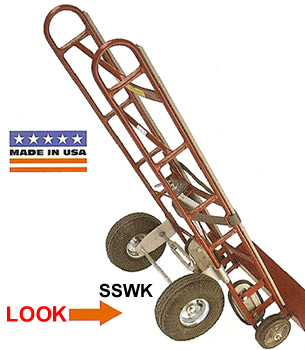 60" and 66" frame - ¾"-14 Ga. steel tube. 72" frame - 1"-14 Ga. steel tube. wheels with roller bearings - #150120. 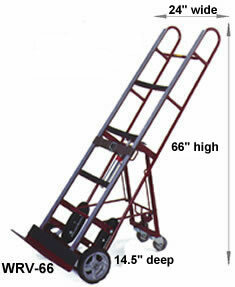 Available with "Auto-Rewind" or "Manual"
Dimensions 8" x 2" 8" x 2"